A hammock chair is associated mostly with outdoor use. However, the ever changing weather makes people realize that indoor hammock chair is a good idea. Watching the world go by indoors in a hammock chair provides a little bit of luxury and a cozy place of retreat. Outdoor hammock chair though is still a best nestling place for the tired and wandering soul. Hanging a hammock chair is laborious and you need to have a complete set of tools. A good location should be considered whether you want it indoors or outdoors. Just keep in mind that the hammock chair should rotate or swing freely without hitting walls if indoors or any obstacle such as tree, porch or beam if outdoors. If the hammock does not have a stand, hanging it is not a problem. A little improvisation shall do the trick. The following are some of the styles in hanging a hammock that could be done when there is no stand available or you just want the thrill of it. •Eyes: The loops at the end of the ropes or strings of the hammock. •Bed: The part where you sit or lay down. •Scale Lines: The strings or ropes that connect the bed from the eyes. Here are two of the most popular styles of hanging a hammock chair which could be done anywhere you want as long as you have something to hang it into. When hanging a hammock swing style without spread bar allows you to rock/swing back and forth while you relax. Hanging this way, you will need two anchors on which to hang the eyes of the hammock or one sturdy tree branch if you want it outside. If inside the house, you have to drill two hooks right into the ceiling beam. Using knot (tying the rope to the hook) or carabiner, attach the rope into the eyes of the hanging hammock and make sure the bed is leveled. If you want the hammock to be hung from a tree, just wrap the two ropes tightly over the tree branch and then fasten the rope to the eyes of the hammock also using a carabiner or a knot. Using the same techniques, when you want a spread bar into the hammock, follow the steps above but only you have to use a single anchor instead of two. To spare you from the arduous task of hanging a hammock chair, there are variety of hammock and stand in combination available in the market today. These combinations are stronger and firmer than conventional hanging. Combining or assembling this type of hammock takes only minutes to make and is not at all time-consuming. You won’t even need tools or trees to set it up! One best example of this type of combination hammock-stand is the Sunnydaze Hanging Hammock Swing with Two Cushions and C-stand Combo, Ocean Breeze. This product by Sunnydaze Décor has hardwood spread bar (dimension: 1 X 36 inches) where you could adjust the distance of the overhead ropes. The hammock is made from soft and durable cotton with polyester canvass that never smell from sweat even when use for a long time. But be sure to wash the hammock occasionally. The materials of the hammock are also stronger but soft to the touch and there is no way it will damage the skin. The rope has a diameter of 0.25 inch, which is thick enough to carry heavyweight sleepers. 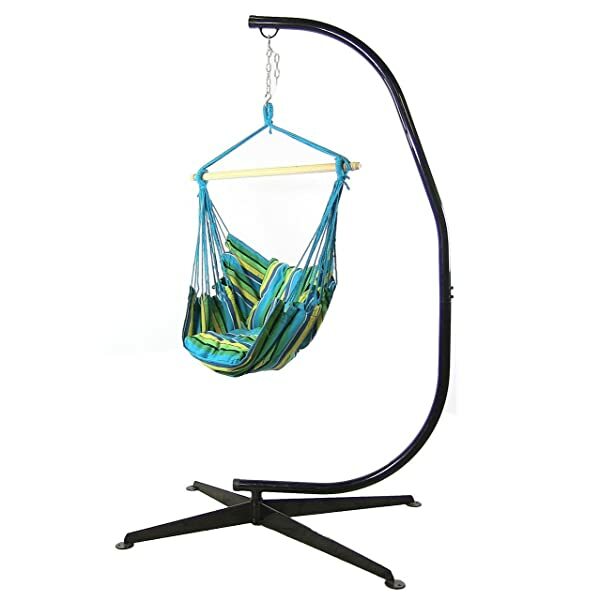 The Sunnydaze Hanging Hammock Swing has two very soft cushions that are very comfortable to the back or armrest. The C-Stand on the other hand, is durable and powder-coated steel that bends but never cracks. The stand needs only minutes to assemble as it is only made up of 4 pieces. Although this has limitation in weight that it could carry (264 lbs. ), the assembly is totally safe and convenient to use anywhere you want it to be. Swinging on this hammock is totally safe and comfortable where the back is totally supported. I think corridor is the best place for hang a hammock because in there you can move your hammock easily. I already hang my favorite hammock in our corridor. It’s really a good thing, I pass sometimes in hang hammock when I stay in the house.